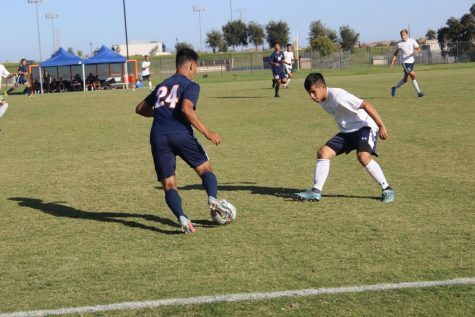 Freshman midfielder Dominic Maestretti helps lead a stifling Hawks defense. The Hawks are 0-0-2 in conference play and have surrendered only one goal in their last five games. 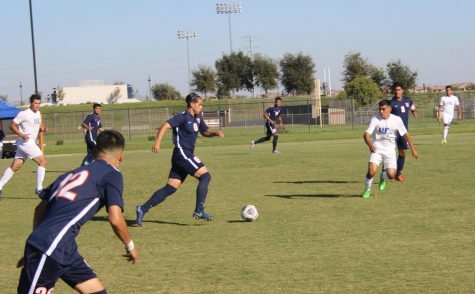 The men’s soccer team opened conference play on Friday against reigning Conference 8 Champion Folsom Lake College and came away with a hard fought 0-0 tie. The Hawks came in riding a three-game winning streak and knew that the Falcons would play a physical, attacking style that would put them to the test. 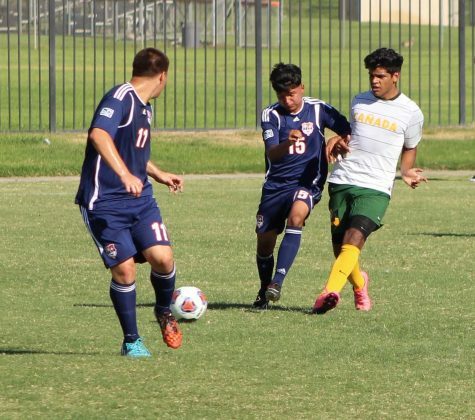 “We knew they were a physical team coming into it,” said freshman midfielder Julio Leal Ruiz. 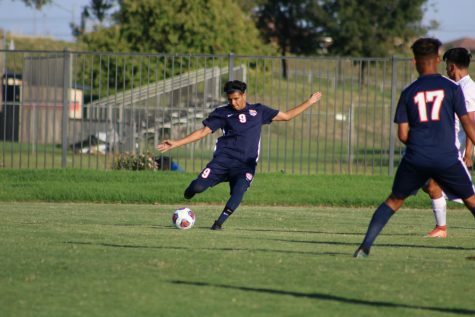 The Falcons dominated the ball to start off the match with the Hawks struggling to gain possession and stay within their game plan. “They came out and had a little more competitive spirit then we did,” said Head Coach Ron Preble. 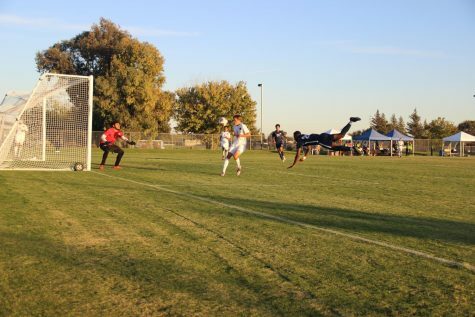 During the first 25 minutes of the game, the Falcons routinely attacked and had 3 shots on goal, although only one shot required a save by sophomore keeper Hector Grajeda. 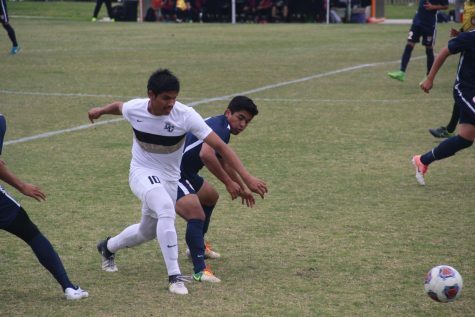 The Falcons played fast and physical with their sophomore midfielder Miguel Medina pushing the ball up field. Medina has eight goals in nine games and had more shots on goal during the game then the Hawks did as a team. “The biggest thing was that we played slow, we didn’t compete and we were slow,” Preble said. 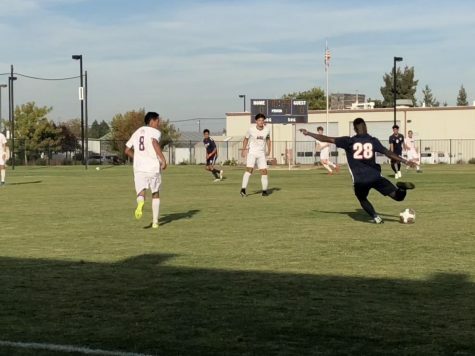 As the first half began to wind down the Hawks began to gain more possession of the ball, sticking to their strategy of slowing the game down and trying to keep the Falcons from attacking. “Our game plan was to knock the ball, keep it simple, have a lot of possession of the ball,” said freshman defenseman Dominic Maestretti. Maestretti, who is a vocal leader on the field also provided some needed toughness when he and Falcons freshman defender Dylan Huft got into a brief scuffle out of bounds. Huft grabbed the ball after it was clearly an inbound for the Hawks and Maestretti went to wrestle it away from him. A little pushing and shoving ensued causing them to briefly fall to the ground holding the ball. Both players received yellow cards. During the second half the Hawks were able to control the ball more often and keep the Falcons from quickly moving upfield. While the Falcons still had some opportunities to score, none of their shots came very close. The Falcon’s swift and decisive play of the first half began to devolve into a sloppy and frenzied style in the second half as the Hawks maintained more possession of the ball. While the Hawks were able to slow the game down and play good defense, they were unable to muster many solid scoring chances. Their best chance came in the final few minutes when Ruiz passed the ball down field to a wide open forward who blazed past the back line of the Falcons and had a free run towards the keeper. 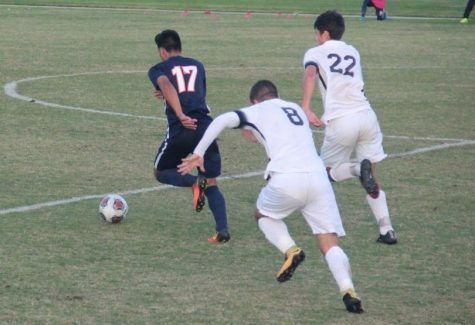 But play was stopped by a questionable offsides call and the referee was chided by coaches, players and fans. “That kid’s a pretty skillful, crafty, player, I think he puts that away,” Preble said. 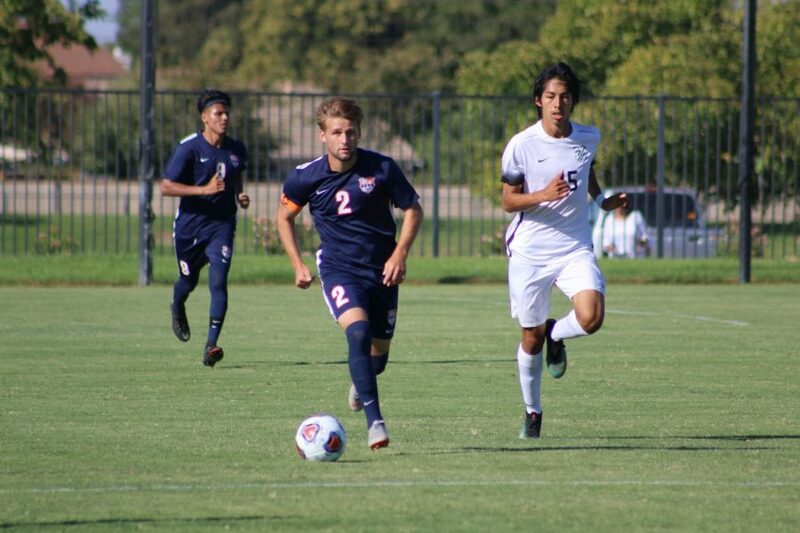 CRC will continue conference play on Tuesday at American River College and will look to stifle their opponent and extend their shutout streak to five. The team said their confidence is high after escaping a down performance with a tie. “We bent but we didn’t break today,” Preble said. 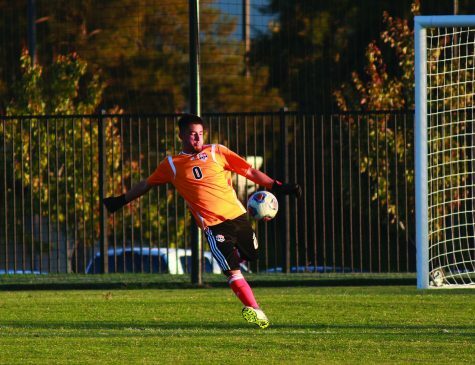 Update: The Hawks played Tuesday night against American River College and in another defensive battle, tied 1-1.